And just because you may think your blog isn’t “pretty” (I do offer blog design services, btw!) doesn’t mean you shouldn’t obey some commonsense rules. Now I may not have a Design degree, but as a Writing tutor, web designer, copywriter, and digital marketer who minored in Writing and Rhetoric, I’ve learned a few tricks to help set any blog apart (in a good way). You’ll notice most (if not all) are for the sake of readability because you should ALWAYS care about your readers’ experience of your site–not just what you think. i honestly don’t understand the blogger movement toward “no caps.” this is one instance where style’s definitely prioritized over function, b/c these bloggers, i’m sure, only care about having their posts look pretty but could care less about readability (ahem, ease of reading). The thing is CAPS were designed to provide a visual break for readers and so they can distinguish where a sentence begins. (Also: a post without caps isn’t pretty.) 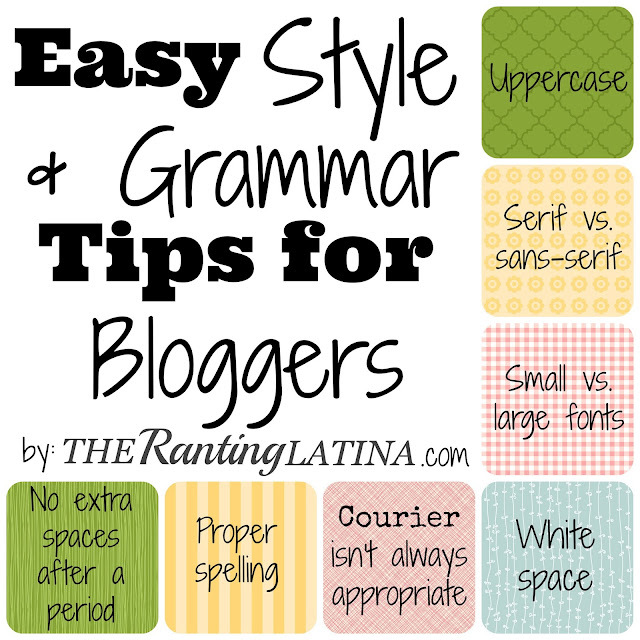 So to those bloggers who avoid caps, I want to ask: ifyou’resoconcernedaboutstyleandeconomizingkeystrokeswhydon’tyousimplystopusingperiodscommasandspaces? On print, serif (aka “tailed”) fonts (think Georgia, Times New Roman, Monotype Corsiva, etc.) are for the body text, while sans-serif fonts (think Arial, Tahoma, Helvetica, etc.) are for headers. But the OPPOSITE APPLIES TO SCREENS like the one you’re reading this on! (Trust me on this.) This is because serif fonts’ tails tire the eyes when focusing on a bright screen, among other reasons. Again, this is an issue of readability and ease of reading. Use mostly SANS-serif fonts on your website. Ever notice how the captions of photos are smaller than the actual body copy pretty much everywhere? Do you know why? Sure, it’s about economizing space, but it’s also, again, about good ol’ readability. Apply that same concept to your blog and make it easy for your readers to follow what you want to say. Small text, in LARGE quantities, is exhausting to read. But what’s “small”? For the body text, size 12 should be the minimum; 13 or 14 are better. For headers (think post titles), size 15-16 should be the minimum. Another vital aspect of blog design, white space also makes it easy for your readers to follow your blog and your posts, as it allows for their eyes to take small breaks in between all your great words, images and/or widgets. Paragraphs should be three to five sentences long, and sentences no more than a line-and-a-half long. There are exceptions to these rules, and certainly varying the lengths of paragraphs and sentences yield well-balanced posts, but take advantage of those exceptions sparingly. A “site” is a place. “Sight” refers to seeing. >> The site of our new home is huge. | There weren’t any monkeys in sight. “Your” is for what belongs to you. “You’re” means “you + are.” >> May I borrow your Tamagotchi? | You’re not at all like Mr. Darcy. “Their” is for what belongs to them; “they’re” means “they + are”; and “there” refers to the placement/location of something. >> Their house is in the middle of the street. | They’re so mean to their sister. | Your Tamagotchi is over there! “Its” is for what belongs to it. “It’s” means “it + is.” >> My house is in the middle of the street; its door is red. | My house is in the middle of the street; it’s huge, too. TOUGHIE AHEAD!! “Affect” (n.) has to do with “feeling,” while “to affect” (v.) is how something impacts another something. Also, “effect” (n.) is a consequence, while “effect” (v.) means to make or bring about.” >> We want to explore the affective components of participants’ attitudes toward recycling. | Our doggie’s passing affected our whole family. | Our doggie’s passing had some odd effects on our family. | We sought to effect change in our company with the new rules. Lastly, “lay” is something you do to an object. “Lie” is something you do yourself. >> I’m laying my book on the table. | I want to lie on that recliner. Are you writing your post on a typewriter? If not, avoid inserting that extra space after a period. That is old-fashioned and just looks odd. So there you have all of my tips (until I come up w/new ones, of course)! NOW TELL ME: What did I miss or which do you think you should improve on? PS- I also design and develop sites and blogs!! Let me know if you’d like me to work on yours. It nearly kills me when I come across blogs with bad grammar. .-. 1. I’m subscribed to a newsletter in desperate need of correct capitalization — all the text is lowercase. I only stay subscribed because of the occasional freebies. The person’s blog is the same way. I don’t understand how people can type without proper capitalization and publish it and be OK with that; I go crazy and feel all gfhjdhjkgsdjfkl. 2. It may be worth mentioning that printed items with sans-serif-based usage only is also appropriate. Sans-serif fonts are easier for autistics and dyslexics because of their curves; serif fonts tend to be more… what’s that word? :x I want to say square, but I’m not sure. Squares are more harsh on the eyes than rounded corners because the thought stops there, and the lack of inconsistency with serif’s serif-like attitude is so gjfskjgkfdl. 6. What about the past tense of lay? I always see lied, laid and lay in place, but I never know which is appropriate. AH. I just noticed the date on this. I clicked the link on the sidebar and didn’t think to check the date. :x I’m sorry! Don’t apologize!! I love comments on ALL my posts–regardless of their date :)! I also love when those comments (like yours) are so well-related to my post, that they almost enhance it, so I really appreciate your feedback and questions. 1. You’re spot on. I can’t stand it and perhaps there should be a “Capitalize or ELSE”-type movement so we can come at those culprits! 2. Yes! I didn’t know that about dyslexia but as far as printed stuff in general, serif is for the body text and sans-serif is usually for headings. Deviations from this for stylistic purposes are common and occasionally look nice, but those are essentially the general rules. 7. Thank you for the comment re:commas! Maybe we need a “Capitalize AND Place Commas Where They Belong or ELSE”-type movement now :). Thanks for stopping by, Liz! !